Split the tractor between the engine and transmission. Once separated, remove the left brake pedal and the brake cross shaft. 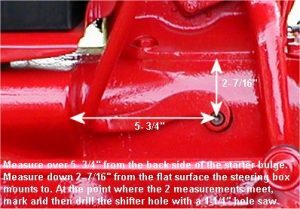 Use the diagram below to locate the spot to drill the shifter hole. The measurements should get the hole location within 1/8″ or closer of where it should be. You may want to use a hole saw to cut a 1″ hole first and then true up the location later by opening the hole to 1-1/4″ with a die grinder. Remove the tractor transmission input shaft and tube. 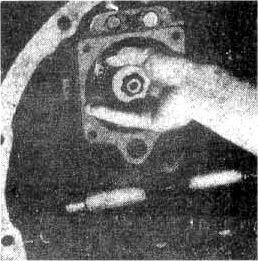 Remove the front input shaft and support tube from the Sherman. Also remove and set aside the thrust washer and bearing that go between the input shaft and the output shaft. Remove the Sherman rear mounting plate and gasket. Bolt the Sherman rear mounting plate to the tractor transmission using at least 2 shims and one paper gasket. You will need a 5/16″ Allen wrench or socket to tighten the bolts. Put the Sherman in place with the gasket on the rear mounting plate and start tightening the 4 mounting bolts. Turn the main shaft inside by hand and note the effort to rotate it (tractor transmission should be in neutral). As you continue to tighten the 4 bolts to pull the Sherman housing up to the mounting plate, keep turning the shaft and check for sideways play and end play. 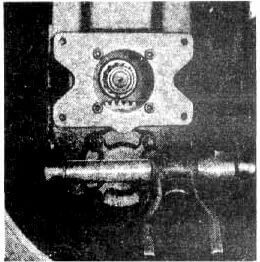 The bearing load is correct when a very slight increase is noted in the effort required to turn the input shaft and very little play can be felt sideways . Add or remove shims until you have the correct preload. Do not load too tight! Too loose is better than too tight. Once you have determined the correct number of shims* needed (if any) pull the Sherman back out and apply Permatex #2 sealer to the rear mating surfaces of the Sherman and the mounting plate and reinstall it. Replace the thrust washer and needle bearing on the front end of the output shaft end and pour 2 pints of gear lube into the Sherman housing. Don’t skip this step! It needs to be full of gear lube before use. Install the Sherman input shaft and support tube back onto the transmission housing (use Permatex on this gasket also). True up the shifter hole if necessary. Bolt on the shifter. Turn the input shaft of the Sherman to be sure it’s free. While still turning the input shaft, shift the Sherman through it’s 3 gear positions to verify it is shifting correctly. Re-install the brake cross shaft, and reassemble the tractor.